The Rakiura Tïtï Restoration Project seeks to repair the injury to Sooty Shearwaters (Puffinus griseus) caused by the T/V Command oil spill in 1998 off the central coast of California by eradication of introduced rats from breeding colonies on four southern islands of New Zealand. The project is spearheaded by Rakiura Mäori, New Zealands most southerly group of indigenous people who manage this taonga (treasured species) which they call tïtï. The restoration team combines the traditional knowledge of the kaitiaki (Mäori environmental stewards) with technical and scientific expertise of the New Zealand Department of Conservation, a University of Otago team of ecologists, and United States environmental education and seabird experts. Elimination of rat predation of eggs and chicks on Taukihepa, Pukeweka, Rerewhakaupoko and Mokonui islands is the most reliable and rapid method of replacing about 15,000 tïtï estimated to be lost because of the Command oil spill. Rat eradication was proposed for mid 2004 and occurred in July 2006 (see update). Computer simulations emphasize uncertainty in outcomes, but most likely scenarios predict complete recovery of the oil spill injury within a year after rat eradication. However simulations using extremely pessimistic assumptions predict that complete recovery may take four decades. Long-term benefits to tïtï and several other species and conservation of ecosystem processes will result. 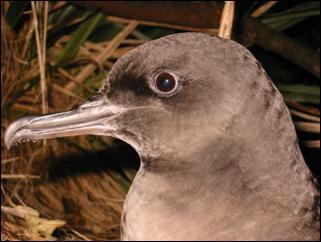 Up to 15,000 adult Sooty Shearwaters may have been killed by the Command Oil spill in September 1998 during migration off the central California coast. 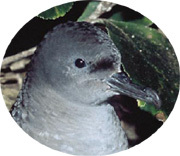 The shearwaters (Tïtï) are a treasured species of Mäori (New Zealands indigenous people) and a keystone species on over 40 Nature Reserves in New Zealand. The kaitiaki (environmental guardians) of the tïtï request funding to repair the oil spill injury by eradicating rats from tïtï breeding colonies. (iv) create educational outreach to inform the people of New Zealand and California about the project. Intensive study of the rate of loss of tïtï eggs and chicks to introduced rats, and comparisons of productivity before and after rat eradication, will allow computer simulation of rate of recovery of the Command oil spill injury post-eradication. Longer-term monitoring of tïtï abundance at fixed study plots 8 and 9 years after eradication will then check model predictions and allow more definitive prediction of ongoing restoration outcomes. A large number of Rakiura Mäori visit the islands each year and they transport considerable quantities of food and gear from a variety of departure points. A concerted campaign to improve quarantine precautions will be instigated by this project. Rakiura Mäori scientists and managers will be employed to visit birders and urge care, to prepare posters and place poison bait stations at landing island sites. A video documentary about the restoration project will be used to heighten community awareness and quarantine efforts. The television documentary will be supplemented by CD-ROMS, interactive web-sites and a complete school educational package to educate Americans and New Zealanders about the project and need for environmental stewardship. All methods for eradication, managing risks and monitoring outcomes have been proven and refined. Experienced and expert teams will secure funders investment in the restoration effort and make the operation safe. Recovery of the injury to tïtï is most likely to be rapid. Multiple long-term benefits to four island ecosystems and several non-target endemic species are certain additional outcomes. The Rakiura Tïtï Restoration Project promulgates a model for international and cross-cultural collaboration to mitigate the effects of a significant oil spill. Education effort will bring lasting benefits for conservation. The Rakiura Titi Restoration Project will build confidence that enlightened research, management and litigation can combine to restore environmental injury resulting from this negligence. This photo shows the understory of a typical Tïtï breeding habitat (manu). 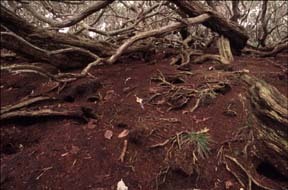 Thick well-developed peaty soil is pitted with breeding burrows under a tangled 3  7 m forest canopy. Tïtï lay an egg within burrows that can be up to 5 m long. Tïtï abundance, breeding success and productivity is determined by counting entrance holes and determining burrow occupancy using an infrared lit burrowscope inserted down the burrows in search of eggs, chicks and breeding adults. 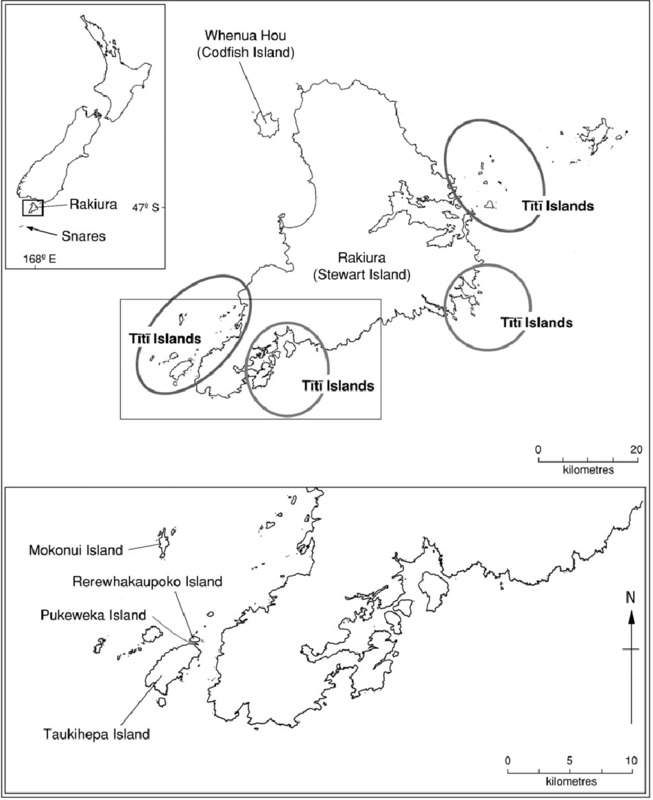 Taukihepa (Big South Cape) is the largest (929 ha) of all the Tïtï Islands and the main target for restoration through rat eradication. It is fringed by steep cliffs and so in many places is accessible only by helicopter. This is ancestral land of scores of whänau (birding families) that continue their culture and livelihoods by a customary 6-10 week heke hao kai tïtï (harvesting expedition). This customary practice and cultural identity is threatened by global pollution and catastrophes like the Command oil spill. Tïtï Islands are one of the world�s treasures of endemic flora and fauna. Because the birds provide a rich nutrient supply, to the islands, the resulting vegetation is stunning. 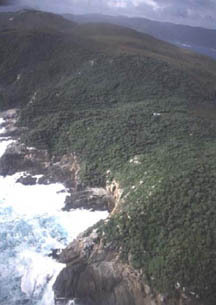 The islands edges are fringed with a canopy of silvery green-gray Teteaweka (Olearia oporina), tree daisies under which the tïtï nest. On the larger islands, such as Taukihepa larger canopy trees such as Rata (Metrosideros umbellata) occur along the semi-protected hillsides, and provide a shaded understory comprised of a diverse assemblage of ferns, hebe, punui, and climbing vines of supplejack (Ripogonum scandens). However, on islands were ship rats (Ratttus rattus) or Kiore (R. exultans) are present, there is noticeable damage to the native plants. As a result, on islands with rats the understory vegetation is less diverse than on rat-free islands. This gorgeous kakariki or Red-fronted Parakeet (Cynanoramphus novaezelandiae), currently occurs in lower abundance than prior to the 1964 rat irruption on Taukihepa (Big South Cape Island). 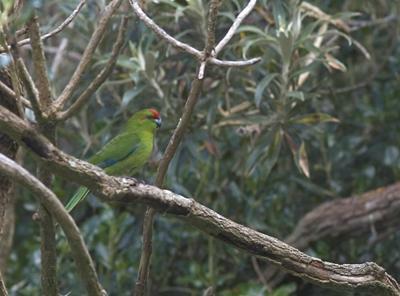 Kakariki are cavity-nesting species and thus vulnerable to disturbance from rats, also competition for food must be important in limiting the abundance of this species on rat-infested islands. Thus the t�t� restoration project should benefit these birds. The truly inspiring part of this conservation project is the potential for reestablishing the Tieke (Philesturnus carunculatus) on Taukihepa Island once rats are removed. 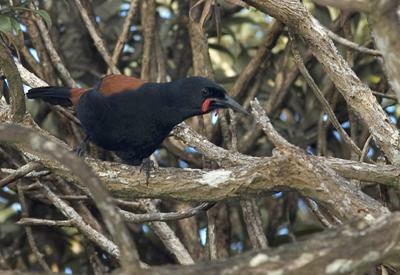 Taukihepa Island was once the last strong hold for this species, which was only found here before the rat irruption and certain eminent extinction of this species was circumvented by conservationists who removed 36 individuals from Taukihepa and place them on nearby Kaimohu and Big Islands. Since 1986, Saddlebacks from this immigrant population have been translocated to several predator-free islands throughout the known historic range, including Breaksea and Ulva Islands. On March 20, A small gathering of birders, researchers, eradication specialists, and others involved in the project gathered together for a ceremony to bless the project at the high vantage point of Taukihepa where the surrounding islands could be addressed. Large insects such as Weta and beetles were more abundant on Tïtï Islands. Once ship rats invaded Taukihepa, a large flightless weevil (Hadramphus stilbocarpuae) became locally extinct. Rodents depredate invertebrates and are especially devasting to flightless forms. Rat-free islands offer valueable refuges for these species. On July 18, the Department of Conservation, working alongside local muttonbirders, successfully spread more than 7 tonnes of bait over the four rat-infested islands off the south-western corner of Stewart Island. This bait drop was the first of two designed to eradicate all rats from Taukihepa (Big South Cape Island), Pukeweka, Rerewhakaupoko (Solomon) and nearby Mokonui (Big Moggy) islands to allow for the recovery of a range of endangered species and the restoration of the islands� unique ecosystem (See press release). Robert Coote, a birder and member of Ka Mate Nga Kiore says that all parties involved in the project have put in long hours of voluntary work to reverse a major past environmental catastrope. It's not over yet however as we have just as great a challenge ahead gearing up to establish the quarantine procedure that will ensure the rats will never come back. Keep the Titi Islands pest-free! It is important for everyone to be vigilant - Inspect gear before departure to make sure no "stowaways" are on board. Store gear with bait stations. Unpack gear inside a closed room so that if one is there, it can be killed before escaping. Finally, notify a member of the island committee immediately when a rodent is detected on island. 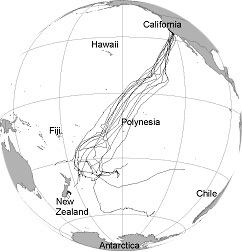 The trans-Pacific pre-breeding migration of 12 Sooty Shearwaters captured and outfitted with satellite radio-transmitters near Pismo Beach, CA Track lines show direct movements from California toward New Zealand and as far south as 60 degrees, near the Antarctic convergence. Tracks shown are from approximately 1 September 2004 to 3 December 2004 (data are ongoing, please visit www.seaturtle.org/tracking or www.signalsofspring.net for maps updated daily).